Adult social care providers can now see what an outstanding service should look like under the Care Quality Commission’s new regulations. The CQC has published guidance on the new system for regulation and inspection of adult social care services in England, which will be rolled out from October 1. The new approach includes the introduction of a four-tier ratings system, which will see services rated as outstanding, good, requires improvement or inadequate. A team of specialist adult social care inspectors will now inspect services against five key questions – is the service safe, caring, effective, responsive to a person’s needs, and well-led – before giving a rating, which will be available to the public. 1. What makes a service outstanding? Good-rated services will need to demonstrate a number of additional characteristics in order to be rated outstanding. Staff must be described as having a ‘high level’ of understanding of a service user’s need to be kept safe and must demonstrate exceptional skills and ability to recognise when a person feels unsafe. Services will use innovative and creative ways of training and developing staff, demonstrate excellent links with health services and a strong emphasis on the importance of eating and drinking well. Services will have a strong, visible person-centred culture, service users will value their relationships with the staff team and feel that they ‘often go the extra mile’ for them, and staff will be highly motivated and inspired to provide care that is kind and compassionate. Staff will have outstanding skills and an excellent understanding of a person’s social and cultural needs, the service will be flexible and responsive to a person’s needs and people’s care and support will be planned proactively with them. 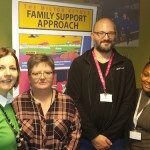 The service has a track record of being an excellent role model, has a strong emphasis on continually striving to improve and its vision and values ensure that service users are at the heart of their work. 2. What makes a good service? The characteristics of a ‘good service’ will form the basis for the whole system and this rating therefore has the most detailed description. Information on the other three ratings builds on this. People are protected from bullying, harassment, avoidable harm and abuse. The service has an open culture on reporting and learning from mistakes, prompt responses to safeguarding concerns and thorough investigations. There is good management of medication and accurate record keeping. Service users are consistently positive about the caring attitude of staff. People receive care from staff who know and understand their history, likes and goals. End-of-life care is compassionate and supportive, with people being supported to make decisions about their preferences. People receive person-centred care and are involved in identifying their needs and how these should be met. A service protects people from the risk of social isolation and loneliness. People have a choice about who provides their personal care. People’s needs are consistently met by staff who have the right skills, qualifications and knowledge. The service keeps up-to-date with new research, guidance and developments in the sector. People are always asked to give their consent their care, treatment and support. People, their family and friends are regularly involved with the service in a meaningful way. Staff have the confidence to question practice and report concerns. The service has a clear vision and set of values that include honesty, respect and safety. 3. Why will a service be rated as ‘requiring improvement? A service that requires improvement may have some features of a good service, but there will be a lack of consistency in the caring approach of staff, the effectiveness of the service, how well it is managed and led, and how well people are involved in relevant decisions about their care and support. Regulations may or may not have been met and there will be an inconsistent approach that means that, at times, people’s health, safety or wellbeing is placed at risk. Inspectors may identify, for example, a lack of time for people to be able to participate in creating their own support plans and a delay in referrals to other health and social care professionals. The service may not always provide the right number of staff, with the right skills and competencies, to keep people safe, and people at risk of poor nutrition and dehydration will not always be sufficiently monitored. 4. What makes a service inadequate? A service that is rated inadequate may have some ‘safe’ and ‘effective’ practice but in general people will not be safe and some regulations will not have been met. It will have “widespread and significant shortfalls” across the five key lines of enquiry and the overall standard of care, support and outcomes that people experience. For example, inspectors are likely to find standardised care records that do not reflect individualised or person-centred care, service users will say that they do feel safe and some will say that they have been harmed or abused, and staff will not have been adequately trained to meet the needs of people using the service.